February’s snow has provided plenty of opportunities for reading. Once the shovelling gets done, it’s great to warm up with a book. While I know we live in Canada and we are all proud of our ability to deal with the weather, sometimes it is nice just to escape from the cold and read. Whether it’s reading at home, in a café, or in front of the fireplace somewhere (like our Fontainebleau location,) one thing can be said for sure: this is reading season. Then again, it’s always reading season if you ask me. Here’s what your library is reading this February. Jazz is the sixth novel by the Nobel and Pulitzer Prize winning author Toni Morrison. The narrative revolves around the murder of a teenage girl in 1920s Harlem, who was shot by her middle-aged lover Joe Trace. As the novel progresses, we learn about the lives of those connected to the pair’s affair, including Joe’s wife Violet. The pasts of these characters are explored, extending back generations to the mid 19th century American South. True to the music the book is named after, the narrative flows with the energy, rhythms, and the call and response style of jazz. Mirroring the shifting rhythms and dynamics of this music, the pace of the story alternates between different characters and settings, ranging from the upbeat and celebratory to the slow and mournful. Characters provide their own stories within the main narrative, invoking the improvised solos of jazz compositions that fit together to create a whole cohesive work. Jazz is an incredible novel that tells a profound story exploring obsession, hope, fear, and the reality of black urban life. To me, science fiction and fantasy stories are great. When they include dystopian futures, an infinite number of universes, and all things 1980’s – they’re even better. My goodness, where to begin. The Golden Age of Video Games, murder, mystery, action, President Cory Doctorow, and Vice President Wil Wheaton? Welcome to Ready Player One. It is simply one of the most fun books I have ever read. Ready Player One follows Wade Watts as he quests to find the ultimate video game Easter egg. The search takes place in a digital universe that has changed the way people experience their lives. While it is chalk full of references to 80’s and geek classics like Pac Man, Monty Pyton, Rush, Family Ties, (and perhaps every other cult hit from any entertainment genre from the era,) it ends up being more than just a story about a people who love one particular decade. It is a sci-fi thriller with murder, romance, action, and it all adds up into great escapism. That said, it also offers some interesting social commentary and insightful discussion around what it means to truly live. What a whimsical sequel to the very delightful Garden Spells! The reader is once again transported to the enchanting town of Bascom, North Carolina, and to the Waverley family. Known for her ability to write charming magical realism stories, Sarah Addison Allen does not disappoint in her newest novel. We were first introduced to the lovely Waverley sisters Claire and Sydney in Garden Spells, and in First Frost we see yet again what a remarkable duo these two make. Now 10 years later, both women have grown-up and have their own children and very successful careers. Only Claire seems to have gotten in a little too deep with the new candy business she started. It is no surprise the public all want a bite of her magically delicious recipes. For both sisters the air in Bascom feels a little tense before the first frost of their enchanting apple tree. When a mysterious stranger appears, everything the sisters know about their family is called into question. It is a fun and light read that has all the aspects of magic, romance and great food that is sure to please many readers! At its core, this is the story of a relationship between a Chinese boy and a Japanese girl, living in Seattle, WA during World War II. How their relationship is affected by the people around them and by the world events, including the interment of the Japanese Americans, is brought to life by the author. Interestingly, the story jumps ahead 40 years, to the 1980s, when a discovery of long-hidden items in the basement of a hotel gives us glimpses into how the intervening years have been spent and what the future might bring. I have borrowed this book a couple of times, but never got to read it; I am really glad that it finally made it to the top of the pile. This title is available in many formats including large print , ebook, and downloadable audiobook . 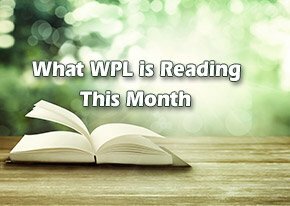 Thanks for checking out what we are reading this month. Until next time, stay warm and well read.